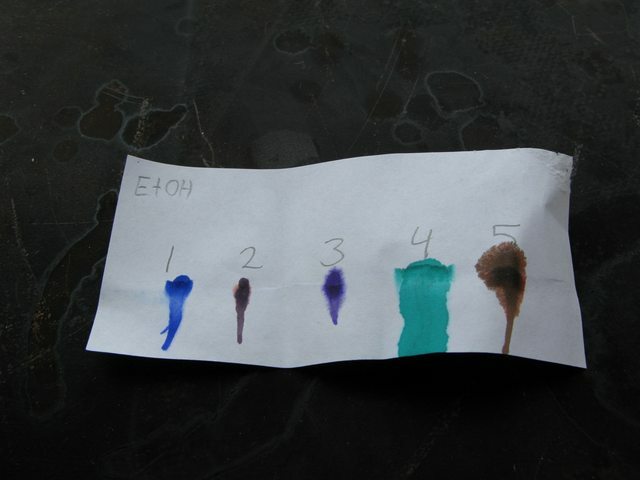 A while back, there was some discussion about fountain pen ink pH. During that discussion, I offered to test inks and my friend from the Geekhack forum, CPTBadass, offered to donate some samples for my tests. I received samples from my good CPT in the mail, and I went about running tests. This post is the outcome of that work. Four samples were procured from CPTBadass and one was supplied by the author. Upon receipt, the samples were transferred to 20mL plastic scintillation vials. The original containers’ opening was too small to accomodate the probe used in the pH experiments. 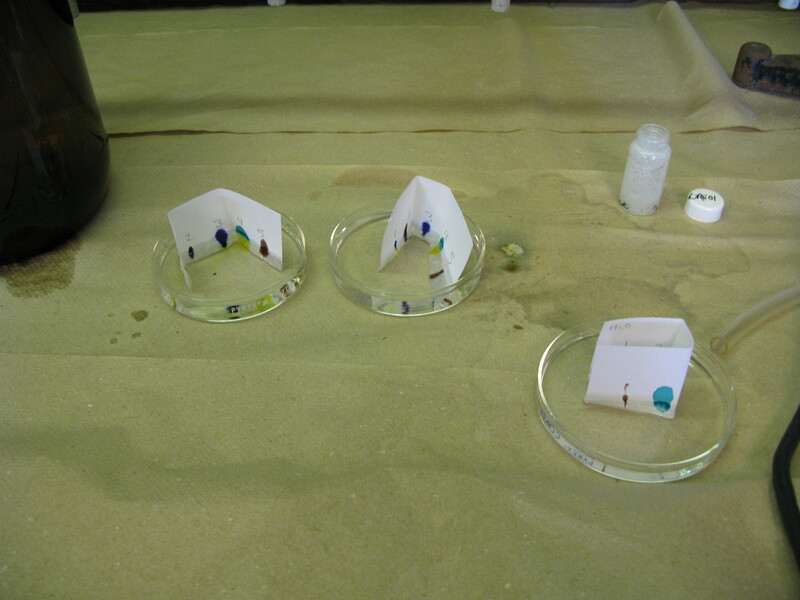 Samples in scintillation vials were given a quick shake and observed for fluid and surface characteristics. Rohrer & Klingner Scabiosa Ink left a very thin layer coating the wall that persisted for some time. The layer highlighted plastic imperfections of the bottle by contrast. It produced bubbles. Noodler’s North African Violet Ink left a very thin layer coating the wall that persisted for some time. The layer highlighted some plastic imperfections of the bottle by contrast. It produced bubbles. Diamine Soft Mint Ink did not coat walls. Preferred cohesion and formed small islands of liquid on the plastic surface. It produced NO bubbles. Noodler’s Polar Brown Ink left a very thin layer coating the wall that persisted for a long time. The layer highlighted plastic imperfections of the bottle by contrast. It produced many/large bubbles. Bubbles appeared to grow over time. The surface coating indicates that there was interaction with the walls of the container. Since the plastic was either polyethylene or polypropylene, we expect the walls to be hydrophobic. The inks which wetted the surface well interacted with the plastic surface. Since bubbles were formed, we can assume that the interaction with the wall was due to surfactant in the ink reducing the surface energy allowing this prolonged contact. The lack of coating in the Diamine sample suggests that it is highly hydrophilic. The lack of bubbles suggests that no surfactant was added to the ink during manufacturing. 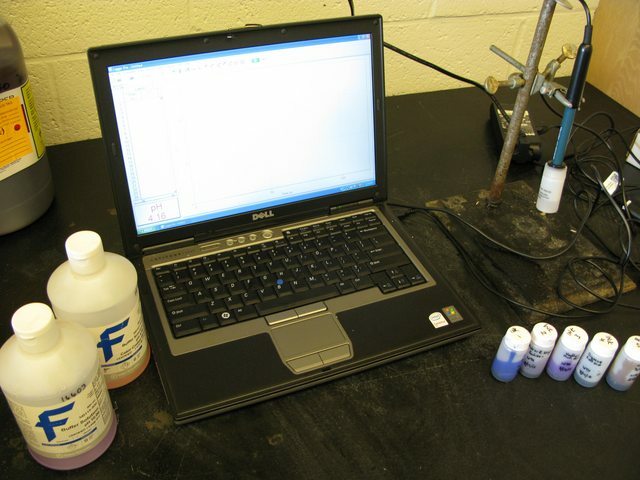 Samples were tested for hydrogen ion concentration using a Vernier pH probe connected to a computer running the logging software. The probe was calibrated immediately before the experiment with a pH 4.00 buffer standard (Fisher – methyl alcohol, formaldehyde, and potassium hydrogen phthalate) and a pH 10.00 buffer standard (Fisher – disodium EDTA dihydrate, potassium carbonate, potassium borate, potassium hydroxide). The lab temperature was 25C, and the standard pH did not need adjusted from the label value based on this temperature. 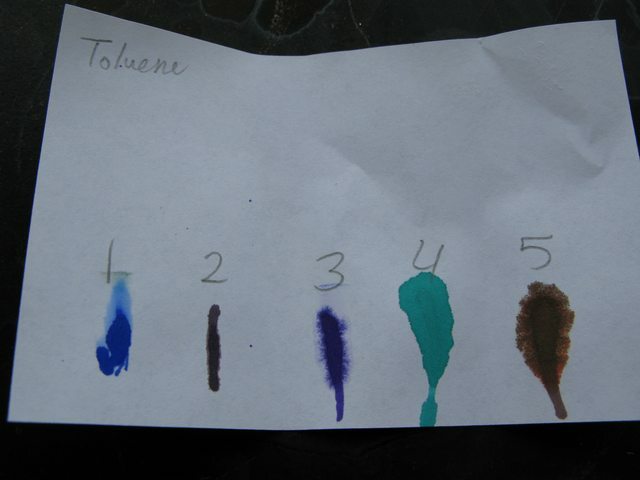 The majority of the inks were slightly acidic in nature, and the Polar Brown ink was slightly basic. The iron gall based ink was quite acidic. This ink pH is marked with an asterisk(*) since the pH was not stable. The value continually drifted downward, trending toward acidity. The value used here was the observed pH value after 15 minutes of attempted stabilization. After the experiments were complete, the pH probe was observed to be slightly discolored. To determine how this effected the results, the standards were measured with the discolored probe. The 4.00 buffer measured 3.74, and the 10.00 buffer measured 9.88. This indicates that the results are probably skewed downward by ~0.25 pH units. The results were not corrected for this error, since it would be difficult to quantify the error without much experimentation. The probe was cleaned by soaking in 2% nitric acid for 30 minutes. After this time, the probe was deemed ‘clean’ and returned to storage. The results of this experiment should clear up a few misconceptions. 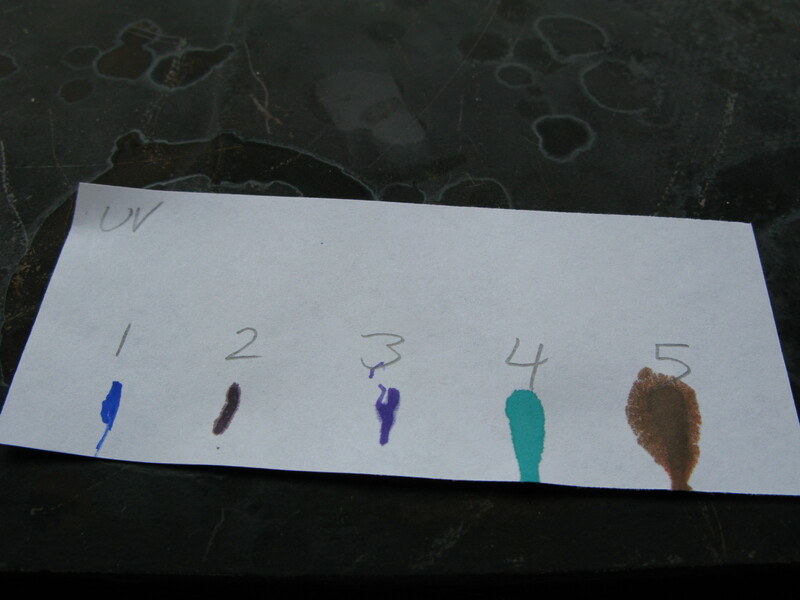 Notably, none of the inks in this less than comprehensive test were pH neutral. Some sources discussed previously make claims based on the acid or base nature of inks based on brand. Clearly, this is not a wise assessment. 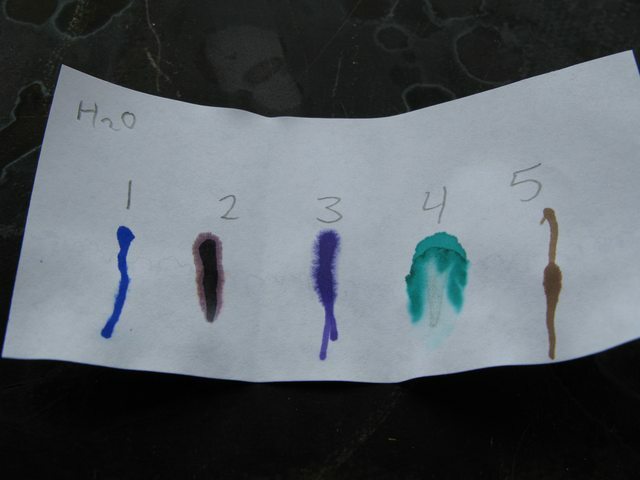 The brand with three different inks in the test (Noodler’s) showed a wide range of pH values. Some outside sources suggest that acidic inks may damage pens. 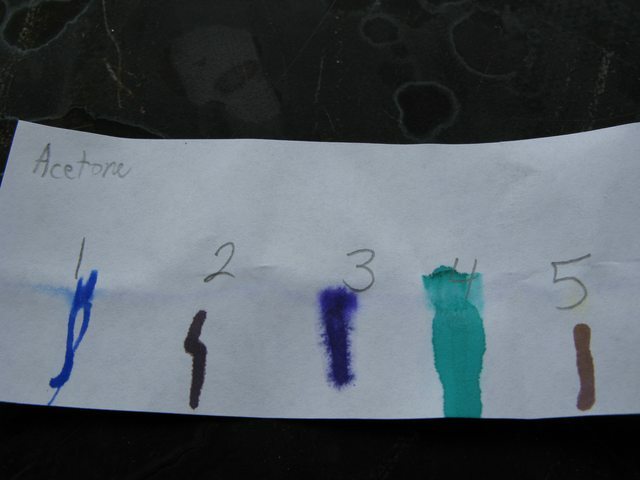 Most of the inks tested were acidic. No metal based tests were performed in this experiment, but this author believes that the correlation between metal pitting and acid content of an ink may be spurious. 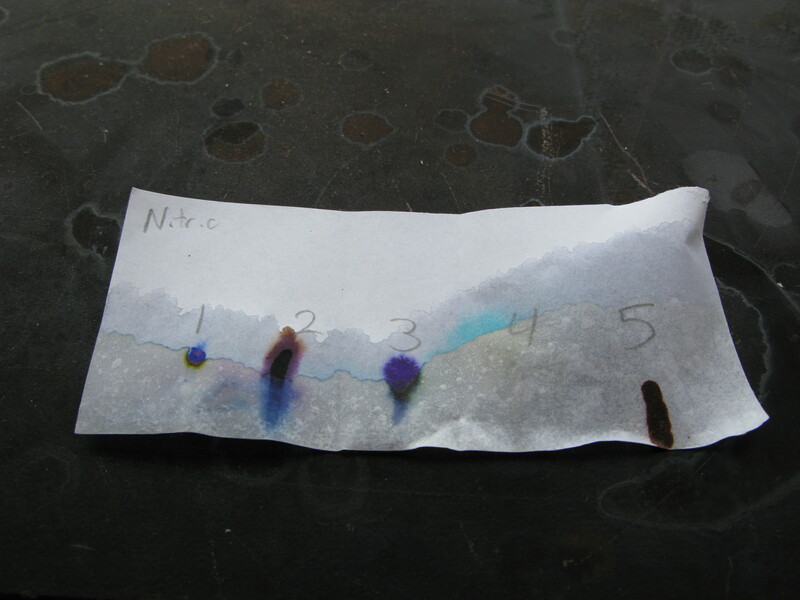 In this test, a small quantity of ink was deposited onto a strip of printer paper (Staples Brand) and partially submerged in solvent. 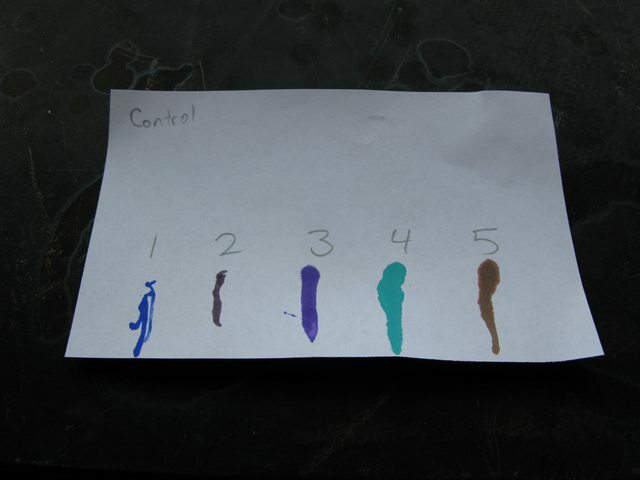 The ink was applied to the paper by smearing one or two drops from a disposable plastic pipette on the paper. All labels on the samples were written in pencil. The ink was allowed to dry then tested. 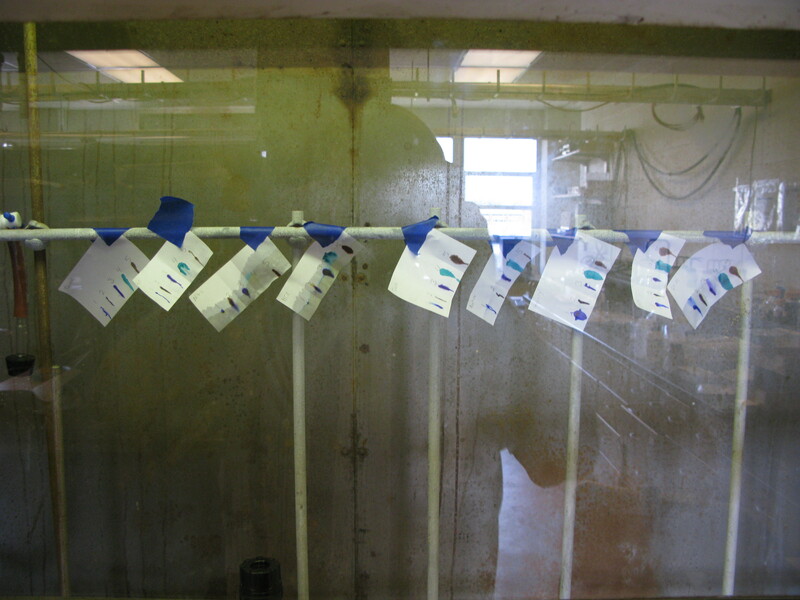 Most strips were folded so they would stand and set in a petri dish with the testing solution for five minutes. These tests were broken up into aqueous, organic, and chlorinated solvent groups to prevent unwanted reactions. The wet papers were then taped to a rail in the hood to dry. One strip was tested under a 18.4 W long wave UV lamp for one hour. One strip was left as a control. The numbers represent the inks Noodler’s Baystate Blue, Rohrer & Klingner Scabiosa, Noodler’s North African Violet, Diamine Soft Mint, and Noodler’s Polar Brown respectively. 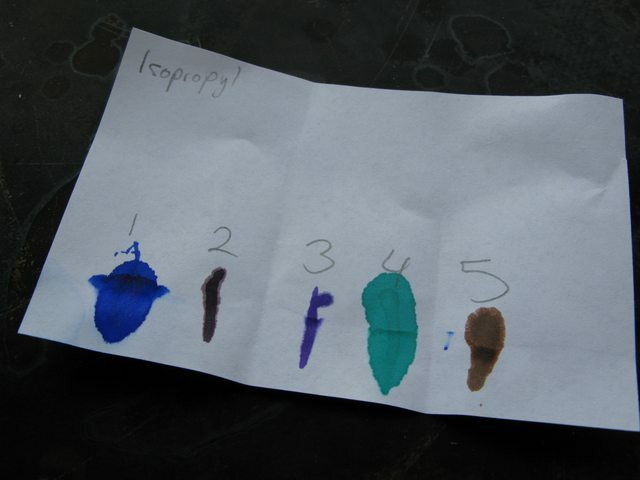 The inks were not applied evenly, and some spreading, especially in samples 3-5 was due to large drops. The Polar Brown ink naturally feathers a great deal on this paper, and the Scabiosa and North African Violet inks showed some feathering. The Soft Mint ink naturally spread, but did not show feathering. There is a great deal of information to be learned from these tests. What we are looking at is actually a very rudimentary form of thin layer chromotography. 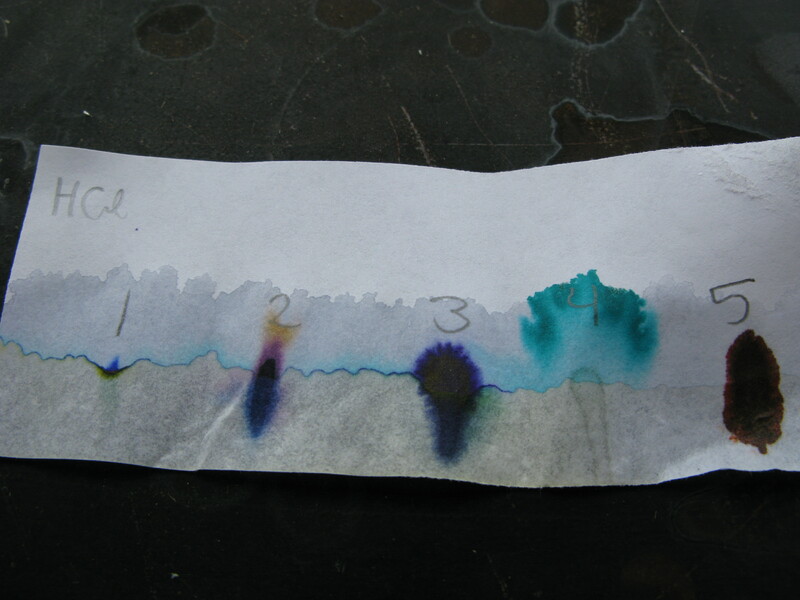 The paper acts as a stationary phase and the solvent as a mobile phase. The mobile phase moves our eluent along the capillaries within the paper fiber matrix. If we let this go for a long time, we would see the individual components separate from each other. There are better methods to perform that experiment though, and it was not in the scope of this one. The goal of the test was to determine the stability of the ink when in contact with the solvents. In doing this, we can learn something about the character of the ink. Different solvents have different polarities. The polarity of a molecule being the concentration of electrons on one side of an atom and exposed protons on the other side. We can relate these by a polarity index. Since “like dissolves like” if something is moved or dissolved by more polar solvents, then the material must be polar. 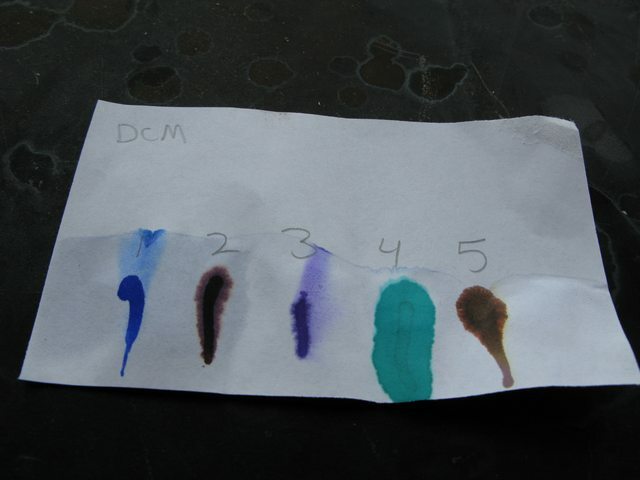 So we can see that the Diamine ink is more polar than the quite nonpolar Baystate Blue based on what different solvents do to it. The Polar Brown ink interestingly slightly drifts in both polar and nonpolar solvents. If you look closely (probably not visible in pictures), you can see a yellow component separate out in nonpolar solvents and a red component separate out in polar solvents. These colors moving out of the bulk drop only slightly affect a color change in the brown. I chose the two acids to test here on purpose. We would expect the HCl to react mostly as an acid, whereas the HNO3 would react as both an acid and a strong oxidizer. 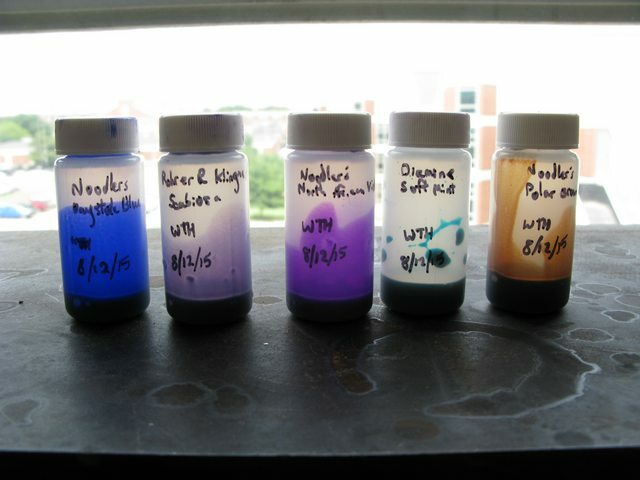 Since both of the acids had similar effects on the inks, we can see that none of the inks oxidize easily – which speaks well for the permanence of these inks. Future tests would include solvents with polarity index of 0. The lack of change due to UV light is good, though this author would like to point out that this was not a very strong source. Future tests should attempt to use more powerful sources such as a laser. All solvents were obtained from Pharmaco Aaper with purity >99.5% except the nitric acid, which was obtained from Fisher. All water used in the experiments was reagent grade, purified by reverse osmosis to resistance of >18Mohms. I would like to thank CPTBadass again for his donations and my advisor for being out of town this week so I could do silly experiments like this without getting yelled at. 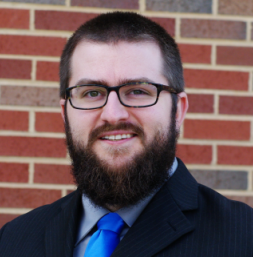 Thank you for reading, I would be happy to address any questions or comments you may have about this work.